Alan Towers has been described as a "broadcasting icon"
The main presenter of BBC TV's Midlands Today through the 1970s and 1980s, Alan Towers, has died. 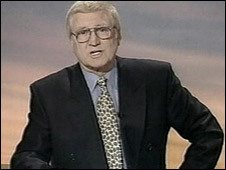 The broadcaster died at his home in Warwickshire on Saturday night aged 73. The long-serving presenter shot to fame on the BBC's Nationwide programme in the 1970s with a story about a skateboarding duck. Mr Towers, who raised thousands of pounds for charity, made comments about BBC management when he resigned on air in 1997. His friend and co-presenter for many years, Kay Alexander, said it was a "privilege" to have known him. She said: "He was kind. He was warm. He was fun. He was very brilliant and very intelligent, but he was completely barmy at times as well. "I shall always be glad that he was my friend." Midlands Today's editor, Chas Watkin, said he was "a larger than life character on and off screen and we'll never see his like again". 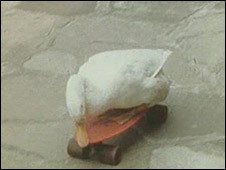 Speaking about the duck story, Alan Towers later said: "The duck jumped on and off the board throughout the four-hour shoot. It was totally genuine." When he resigned on air, the presenter said: "When I joined the corporation it was led by giants. Now I'm afraid it's led by pygmies in grey suits." The presenter had two heart attacks and a triple bypass. He raised money walking the Great Wall of China and riding on a motorbike across Canada, saying he just wanted "to put a little bit back". On the Alan Towers Appreciation Society on the social networking website Facebook he is described as a "broadcasting icon". He replied that he was really a "miniscule unimportant icon remembered by pensioners in their dotage".